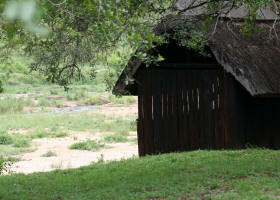 The beautiful, tranquil Biyamiti Bushveld Camp has an amazing bird hide situated in the camp on the perimeter fence. This is where the camp trail starts, in front of unit 10 in the Biyamiti Camp. The bird hide at Biyamiti can be a cool place to spend a hot afternoon and watch the birdlife frolic in the trees close by or wait for game to appear from the thicket to come and drink from the river or the pools in the dry season. 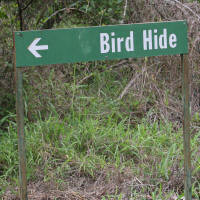 If you have some time when you are in the camp, have a walk to the bird hide and relax and absorb the African bushveld. What Can Be See From The Hide At Biyamiti Camp? Game viewing can be a bit slow at times from the hide, but there are normally all sorts of bird species around, alternatively you can do the walk in the camp. 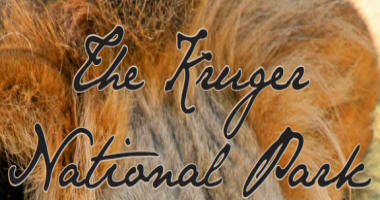 Game Viewing: Impala, Vervet Monkey, Tree Squirrel, Bushbuck, Kudu, Buffalo, Elephant, Leopard, Lion.